Image caption Cha do chòrd an turas mu dheireadh aige a dh'Inbhir Nis ri Anthony Stokes, ach a bheil e gus tilleadh ann an dathan Chaley Thistle? 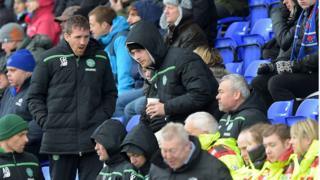 Dhearbh Iain Hughes gu bheil Caley Thistle airson Anthony Stokes a thoirt à Celtic air iasad. Cha do chluich Stokes ach aon gheama lìge do Celtic air an t-seusan seo. Chaidh a chasg leis a' chluba fad cola-deug san Dùbhlachd às dèidh ghearain air Twitter mu dhìth chothroman. Sgaoil Stokes an tweet nuair a chaidh fhàgail a-mach às an sguad 'son geama ann an Inbhir Nis. Tha Hughes eòlach gu leòr air Stokes. 'S e a thug an t-Èirinneach a dh'Alba an toiseach nuair a bha e os cionn na h-Eaglaise Brice. Bha Stokes soirbheachail an sin, agus a-rithist nuair a bha e fo stiùir Hughes aig Hibs. "Tha sinn air faighneachd mu dheidhinn, ach tha cuideachd sgiobaidhean eile air faighneachd mu dheidhinn", thuirt Hughes. "Chuir e tadhail dhomh roimhe. Tha fios a'am ciamar a gheibh mi a chuid as fheàrr às agus ciamar a chumas mi smachd air", thuirt e.
Tha sgiobaidhean eile ann an Alba agus Sasainn cuideachd air ùidh a shealltainn ann an Stokes. A' bruidhinn air Aithris na Maidne, thuirt eòlaiche a' bhuill-choise, Ailig O'Henley, nach robh dùil gun gluais cùisean gus an tèid cùis-lagha an aghaidh Stokes ann an Èirinn a rèiteach. Thuirt Mgr O'Henley cuideachd gum b' fheàrr le Celtic Stokes a chur gu cluba ann an Sasainn. Tha Caley Thistle cuideachd air dearbhadh gu bheil Tobi Sho-Silva air tilleadh gu Charlton Athletic. Tha Miles Storey, fear eile a thàinig thuca air iasad à deas, air aontachadh fuireach le Inbhir Nis gu deireadh an t-seusain.